Maho Bay St. John features gorgeous, teal waters surrounded by white sand and lush green forests. Boats sit out in the bay catching rays, while beachgoers lounge in the shade of breezy coconut palms. Maho Bay St. John Island has been voted a visitors favorite beach on the island. This is deservedly so! With its light surf, easy access, and pristine scenery, it is a popular beach for families with small children. During the busy summer months, Maho Bay St. John can get crowded, so be sure to head out early and stake your beach chair claim! Here are just a few reasons why you should choose Maho Bay in St. John as your beach destination during your stay with CimmaronStJohn. One of the biggest draws to Maho Bay St. John, of course, is the beautiful beach. The white sand and clear water provide a wonderful atmosphere for a variety of activities. Lounging on the beach under the shady palms is a favorite pastime. However, the light surf provides great opportunities for floating or swimming in the bay. The surrounding forests are also great for exploration. Take a break from the sandy shoreline and crystal waves to hike into the encompassing jungle. You might find some St. John island wildlife or catch some much-needed shade from the beaming sun. If you prefer to stay on the sand, you can enjoy a variety of fun activities, from frisbee tossing to beach volleyball. The beach also features its own bathrooms. If you function better in the sea than on land, snorkeling might be an activity to enjoy at Maho Bay St. John. On the western side of the bay, you will find a great location for diving. The whole area is an ideal space for finding sea turtles and rays feeding in the underwater grasses. Snorkel along the shoreline and spot some young tarpon and schools of bait fish. These creatures tend to travel up and down along the water’s edge. You are sure to see some stunning wildlife during your snorkeling adventures at Maho Bay St. John! Your adventures at Maho Bay in St. John won’t be complete without viewing the American Hill Great House Ruins, which overlook Maho Bay. This historical landmark is located high up on the western ridge of the bay and can be seen from the shoreline. These ruins serve as the remnants to a 19th-century Caribbean great house. Before you fall asleep on the beach, consider an adventure to this location to see the ruins for yourself. Though not directly accessible from Maho Bay, the ruins are accessible from a trail beginning at the nearby location of Cinnamon Bay. You can hike along the Cinnamon Bay Trail until it meets up with the America Hill Trail. Then, follow this pathway until the American Hill Great House Ruins are in sight. Feel free to explore this piece of the island’s past. After enjoying a wonderful morning or afternoon at Maho Bay St. John, come back to your vacation villa. 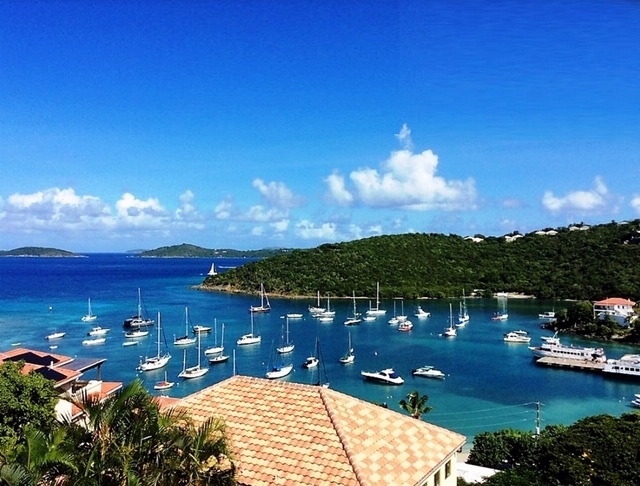 CimmaronStJohn offers villa and condo rentals all over the island. Find the spot that is right for you. No matter where you decide to stay, you will be close by a wonderful island adventure and some precious moments of relaxation as well. We hope you have an incredible stay and make some fantastic memories on St. John!